I am a huge fan of stickers. Maybe it goes back to elementary school, when rather then grades, you got a cool sticker on your homework, if you did good enough. It was a very clear and rewarding indication of success. I am sure some teacher was having a hard time getting a bunch of 10 year olds to understand why getting a "checkmark plus" was something to stive for, while getting a "X" was to be avoided. They probably began drawing smiley faces and frowny faces on homework to show graphically the emotion the student's hard work (or lack there of) had produced in the heart of their teacher. But at a certain age, kids get wise to that sort of guilt manipulation and stop caring. So then one enterprising teacher browsing in Woolworth's, saw a sheet of stickers for the Monkees or something, and had the idea of decorating the successful papers to give their student's tangible results on their homework. I like tangible results. They encourage users to continue with behavior that you as a designer want to encourage. Also I like stickers, because they are empowering. You can peel them off and apply them to something, changing it. leaving your mark on it. Transforming it by your own hand. In my D&D game we have found that it has been hard to track effects that last for more then the length of a turn. As the DM I have had to keep a legal pad ready to track just what all is going on with the Mobs, and who has used an action point, etc. But as the players get higher level they gain powers that have more complex effects, many of which combine to produce powerful results. So important for everyone to be able to understand every effect that is inplay at the start of their turn. +/- 2,5,10,15 markers (For use for other ongoing effects, and other specific situations. For instance, as a reminder that a character has cover (and thus a -2 to be hit) from a specific enemy. You might use a -2 lable, and draw an arrow toward the enemy it applies to. ...anyway leave a comment and let me know how well these work, or if there is anything I have overlooked. I am thinking of these more as player reminders, which is why I focused more on unique colors then trying to cover every situation. 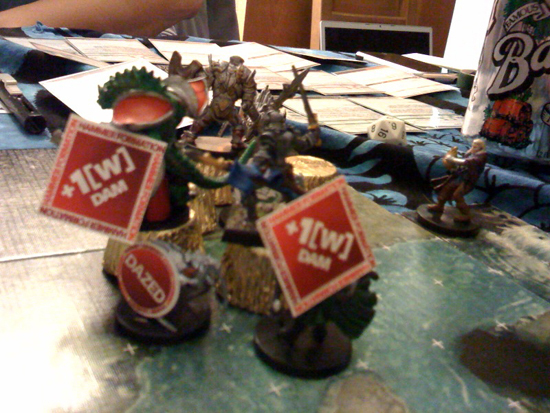 Anyway, If i had to choose between noting on a sheet of paper that I had caused an ongoing fire damage effect, versus getting to slap a big old "on fire" sticker with flames on it, on the DM's fancy troll mini, I know what I would pick as a player.